Melania is available for worldwide events and bookings. Make your next corporate event, private party, or sales meeting a success by inviting Melania! For a very special event consider having Melania and her team create a custom speech. 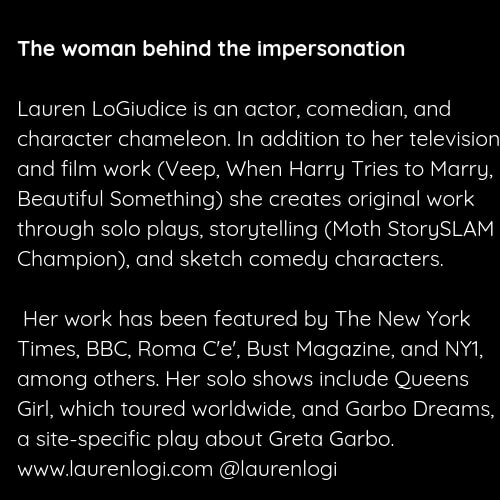 ​Impersonator Lauren LoGiudice has worked with directors around the world. She has a highly collaborative approach to make coordinating with your production and artistic team easy. “Lauren is the type of actor who I, as a director, always hope for: Talented, collaborative, insightful, professional, craft-driven. She is a very bright light." Stay up to date with all things Melania. For booking requests fill out this form. My feed on Instagram -- @flotusofficial -- is the premiere location for Melania Trump comedy and the only such outlet with cross-the-aisle appeal.